Chartpak's Rapidesign Telescoping Document Tube allows for the safe storage and transport of artwork, prints, posters, and precious papers. 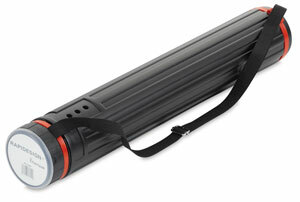 It expands from 26" to 43¼" (from 66 cm to 110 cm) in locking increments. This large 4¼" (11 cm) diameter tube has a screw-off cap with a replaceable identification label. The nylon shoulder strap is adjustable.